A major obstacle to applying genetic engineering to benefit humans and the environment is the risk that organisms whose genes have been altered might produce offspring with their natural counterparts, releasing the novel genes into the wild. Now, researchers from the University of Minnesota's BioTechnology Institute have developed a promising way to prevent such interbreeding. The approach, called "synthetic incompatibility," effectively makes engineered organisms a separate species unable to produce viable offspring with their wild or domesticated relatives. Synthetic incompatibility has applications in controlling or eradicating invasive species, crop pests and disease-carrying insects as well as preventing altered genes from escaping from genetically modified crops into other plant populations. The results were published online today in the journal Nature Communications. The technology uses a new class of molecular tools called "programmable transcription factors" that make it possible to control which genes are turned on and which genes are turned off in an organism. If an engineered organism mates with a wild counterpart, the transcription factors render the offspring unable to survive by activating genes that cause their cells to die. "This approach is particularly valuable because we do not introduce any toxic genes," said Maciej Maselko, a postdoctoral scholar from Smanski's lab who performed the work. "The genetic incompatibility results from genes already in the organism being turned on at the wrong place or time." The research was done in brewer's yeast, but it can potentially be applied in insects, aquatic organisms and plants using a new gene editing technique known as CRISPR-Cas9. "Other methods to control gene flow, for example disrupting pollen or using a chemical to control reproduction in crops, are very species-specific and change how the crops are propagated. Our approach is expected work in virtually any sexually reproducing organism without changing how they are normally grown," said Michael Smanski, an assistant professor who led the study. Synthetic incompatibility may make it possible to use crops to produce medications as well as food, feed and fuel. It also raises hope for using genetic engineering to control populations of invasive species or pests such as Asian carp in North America and disease-carrying mosquitoes throughout the world. The next step, Smanski said, is to demonstrate the approach can work in organisms other than yeast "We're working on moving into model fish, insects, nematodes and plants," he said. The University of Minnesota College of Biological Sciences seeks to improve human welfare and global conditions by advancing knowledge of the mechanisms of life and preparing students to create the biology of tomorrow. 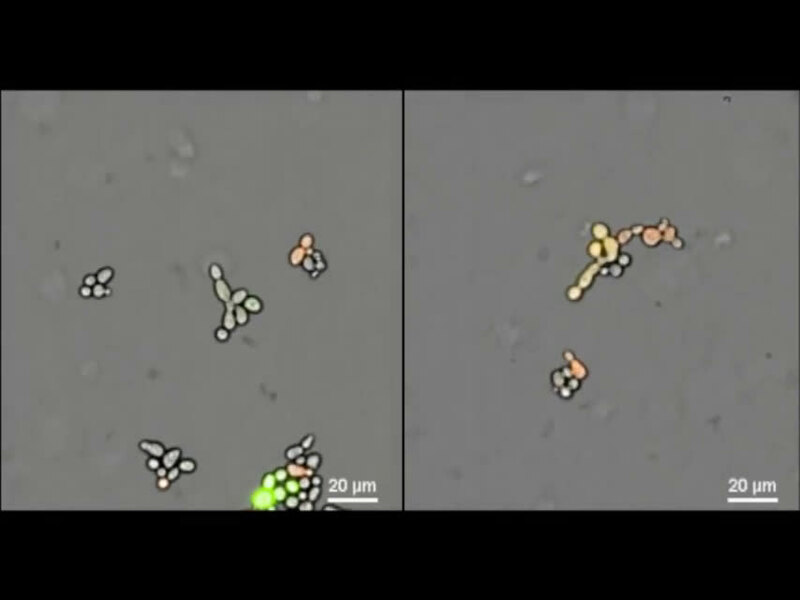 Video Caption: Live-cell imaging videos showing the results of mating experiments in yeast. 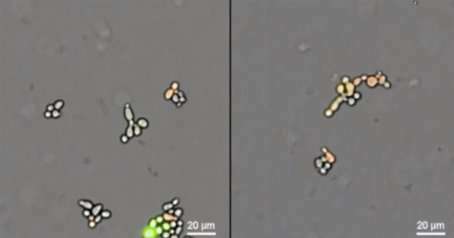 Offspring from wild-type yeast (left) grow and divide to form a micro-colony. Hybrid offspring between wild-type and a 'synthetic incompatibility' strain (right) are not viable. Is it such an improvement if GM/non-GM strains which cross are not viable while the pure GM strain remains viable? Does this not make it easier, almost necessary, for a GM strain in the wild to replace its non-GM rivals?